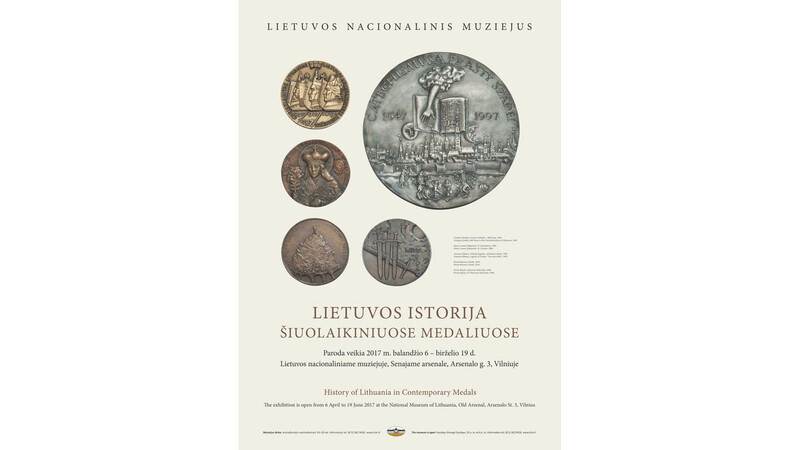 From 6 April to 19 June 2017 (to renew a exhibition to 25 June), the National Museum of Lithuania held the exhibition “History of Lithuania in Contemporary Medals”. The exhibition covered a period of almost eight hundred years of Lithuanian history from the first mention of the name of Lithuania to the Third Partition of the Polish-Lithuanian Commonwealth, commemorated in contemporary medals (177 pieces). The visitors could see works by artists from Lithuania, Poland and the USA from the 1970s–1990s to the early twenty-first century. The medals presented in the exhibition pay homage to significant events of the history and culture of Lithuania from the eleventh to the eighteenth century. The medal dedicated to the first mention of the name of Lithuania in the Annals of Quedlinburg in 1009 (artist Petras Repšys, 2001) bears the images of the tortured Bishop Brunon who was proclaimed a saint, and the Prussian ruler Netimer christened by Brunon. The medal commemorating the millennium of the mention of the name of Lithuania (artists Lina Kalinauskaitė, Juozas Kalinauskas, 2009) is a token of great respect for Lithuanian rulers and fighters for the freedom of Lithuania. Various dates and events, plots and portrait compositions are featured on the medals. Worthy of mention are medals dedicated to significant battles: Saulė (1236), Durbė (1260) and Grunwald (1410), on which battle scenes, rulers, armoury and various symbols are depicted (artists Petras Baronas, Bohdanas Chmielewskis (Poland), Lina Kalinauskaitė, Juozas Kalinauskas, Elena Palšytė-Kasperavičienė, Antanas Rimantas Šakalys, Skaistė Žilienė). The exhibition included medals by Lithuanian artists with portraits of the rulers of the Grand Duchy of Lithuania and the Polish-Lithuanian Commonwealth: King of Lithuania Mindaugas (artists Jonas Noras Naruševičius, Petras Repšys) and Queen Morta (artist Juozas Kalinauskas), Grand Duke of Lithuania Gediminas (artists Lina Kalinauskaitė, Vaclovas Kosciuška, Eglė Žilytė), Grand Duke of Lithuania Vytautas (artists Tadas Deksnys, Petras Gintalas, Vytautas Kalinauskas, Gediminas Lašas, Juozas Žarys) and others. Series of medals with images of the rulers of the Polish-Lithuanian Commonwealth, produced by the Mint of Poland, were created by Polish artists Jerzy Jarnuszkiewicz, Ewa Olszewska–Borys and Witold Korski. The exhibition also contained medals dedicated to the father of Lithuanian belles-lettres Kristijonas Donelaitis (1714–1780; artists Petras Baronas, Romualdas Inčirauskas, Antanas Olbutas, Erikas Varnas (1924–1991) and his poem The Seasons (artist Eglė Čėjauskaitė-Gintalė, Jurgita Erminaitė-Šimkuvienė, Sebastian Piotr Mikołajczak (Poland), Aurelija Šimkutė-Endriekė), as well as other remarkable historical, cultural and public figures of Lithuania and Lithuania Minor from the sixteenth to the eighteenth century: the author of the first Lithuanian book Martynas Mažvydas (1520–1563, artists Petras Baronas, Algirdas Bosas, Petras Repšys), the creators of Lithuanian writing Mikalojus Daukša (between 1527 and 1538 – 1613; artist Petras Repšys) and Daniel Klein (1609–1666; artist Petras Baronas), the fosterer of the Lithuanian language Gottfried Ostermeyer (1716–1800; artist Petras Baronas), the book printer who published the first book in Lithuania in Ruthenian (Old Belarusian), Francysk Skaryna (circa 1490 – circa 1541; artist Aloyzas Jonušauskas), the vice-chancellor of the Grand Duchy of Lithuania and the Elder of Telšiai, a representative of one of the richest and most influential families, Paweł Stefan Sapieha (1565–1635; artist Petras Baronas), and the diplomat, political figure of the Polish-Lithuanian Commonwealth and composer, Duke Michał Kleofas Ogiński (1765–1833; artist Skaistė Žilienė). In the Soviet period, themes of historical memory were obliterated, and thus in the second half of the twentieth century, medals representing the early architecture of Lithuanian cities became popular. Commemorating this topic in medals was a way for artists to tell the history of the Grand Duchy of Lithuania. The visitors of the exhibition could see medals dedicated to the capital of Lithuania, Vilnius (artists Kazimieras Barišauskas, Algirdas Bosas, Alvydas Drūlia, Petras Henrikas Garška, Tamara Janova, Antanas Olbutas, Petras Repšys, Antanas Žukauskas), Trakai (artists Albinas Purys, Antanas Vaičekauskas), Kaunas (artists Viktoras Palys, Antanas Vaičekauskas) and other cities. State heraldry of Lithuania (Vytis) came to be widely represented in medals in the late 1980s, with the advent of the national movement (artists Danielis Juozapas Antušas, Juozas Žarys, Skaistė Žilienė). Medals on the religious theme devoted to the 600th anniversary of Christianization of Lithuania and Samogitia were created by Lithuanian artists Vladas Vildžiūnas and Laima Kėrienė, and the Lithuanian American artist Vytautas Kašuba (1915–1997). In Vildžiūnas’s medal commemorating the anniversary of the Christianization of Lithuania (1987), seven crosses are represented: six of them symbolize the past six centuries of Christianity in Lithuania, and the seventh one refers to the current period. The medal dedicated to the anniversary of the Christianization of Samogitia (2013) depicts King of Poland and Grand Duke of Lithuania Vytautas, with a composition of seven crosses in the centre representing the spread of Christianity in Lithuania and Samogitia. Depicting patron saints of Lithuania is another topic characteristic of Lithuania as a Christian country. Medals with images of the Prince of the Grand Duchy of Lithuania and Poland, Saint Casimir, were created by artists Petras Henrikas Garška, Tamara Janova, Stasys Leonas Makaraitis (1938–2014), Antanas Žukauskas and the Lithuanian American artist Petras Vaškys (1921–2001), while Antanas Vaičekauskas designed a medal representing Saint George. Works by talented medallists of different styles and production techniques (cast, hammered, electrotyped), made from various materials: metal (copper, brass, bronze, silver, aluminium), ceramic, gypsum and leather, formed an interesting artistic and historical whole in the exhibition. In the second half of the twentieth century, ceramic medals were very popular. They were produced from yellowish, white, red and natural clay, and could be darkened or coloured. Medals were made in different sizes, forms, and most often had a hole for hanging. On ceramic medals, state heraldry of Lithuania, portraits of the rulers of the Grand Duchy of Lithuania, Lithuanian cities and their architectural monuments were represented. Many of their authors remain unknown. Artist Bronislovas Baliulevičius (1932–2009) was one of the first to start creating ceramic medals. Historical themes and early Lithuanian architecture prevail in his works. In the exhibition, the visitors could see a medal to Kėdainiai created by Baliulevičius. The method of imprinting double-sided medals in ceramic invented by the artist was a novelty. The exhibition also contained ceramic medals created by Juozas Žarys and Danielis Juozapas Antušas. They were mainly produced at the Rokai ceramic factory and Dailė art production factories in Vilnius, Kaunas and Klaipėda. Medals from various metals were produced in these factories as well as the Druskininkai art production company. The exhibition contained both limited-circulation and large-circulation medals. The latter were minted in the Lithuanian Mint, the Mint of Poland and the Franklin Mint (Philadelphia, USA), and produced by LLC “Monetų namai”, LLC “Metalo forma” and Medallic Art Co (Danber, USA). Medals on historical themes shown in the exhibition are held at the National Museum of Lithuania, which boasts the largest collection of memorial medals in Lithuania.